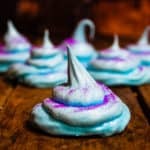 I created an Aladdin inspired dessert in preparation for the NEW Disney live action Aladdin movie coming to theatres May 2019. This genie themed dessert would be perfect for a viewing party or birthday. Line 2 baking sheets with silicon mats and set aside. In a large bowl, mix the egg whites, salt and cream of tarter. Using a hand mixer, beat the mixture on high untilsoft peaks begin to form. Gradually add in the sugar a little bit at a time and mixing on high in between each addition. Mixture should have stiff peaks and sugar should be thouroughly dissolved. Fold in the vanilla extract and blue food coloring. Fill a large piping bag with mixture (or zip top bag with corner snipped off) pipe onto the prepared baking sheets. The meringues don’t spread so make sure you have enough room to bake them all at once. Dust with glitter if desired.